Kick Starting English Literature Revision @ Bushey Meads! Bushey Meads English Faculty Keep Going Year 11! 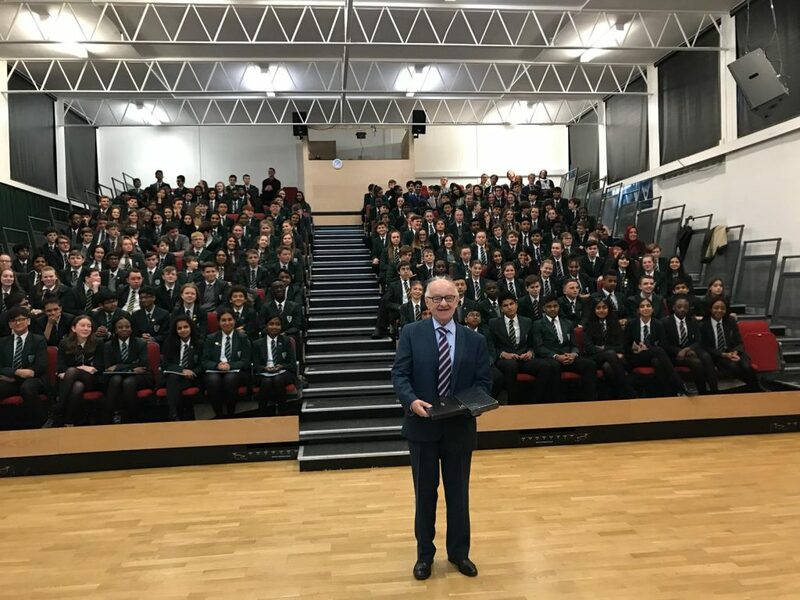 On Tuesday 12th March, the entirety of year 9 was fortunate enough to have a very special visitor come in to talk to us. The visitor was 90 year old Zigi Shipper, a Holocaust and WW2 survivor. The visit was part of year 9’s English study on the Holocaust and the Kindertransport. Mr Shipper, or Zigi, as he insisted on being called, spoke to us about the harrowing persecution of his family and people, his trauma and life remade after the war. Zigi was born in Łódź, Poland on January 18th 1930. At the age of 5 his parents got divorced and his mum left, and due to a lack of clarification from his grandparents, he believed her to be dead. He was raised by his grandparents and attended a Jewish school. Zigi described his childhood as happy and one that was very much ordinary. He was 9 when World War 2 broke out, and his home country, Poland, was attacked. His father, knowing of the impending Nazi persecution left the family to try and enter safety in the then Soviet Union; he believed that elderly and young Jews were not endangered by the Nazis. However, this was not the case. Poland was completely invaded and occupied within 6 weeks, and the effects of Nazi anti-semitic laws were instantly felt. Jews were not allowed to go to school, and began losing jobs, and widespread violence began. Gradually, the anti-semitic laws intensified, and Zigi and his family, along with 150,000 Jews were forced to live in a Ghetto. When Zigi was 10, he went to work at a metal factory, to provide enough to get food for himself and family. His grandma went into hiding, and urged him to join her, however Zigi refused, thinking he was safe. In 1942, all Jewish children were put on a lorry to be deported from the ghetto. But Zigi jumped off the lorry and escaped the lorry to return to the ghetto, forever changing his life and fate. In 1944 the metal factory was liquidated due to the Soviets closing in. It was here that Zigi taken to Auschwitz. There he witnessed many horrors, people being selected to die, people dying all around him, mothers and even babies being shot. Here, Zigi met with true starvation, only receiving one slice of bread and black coffee a day, he described this as one of his worst memories. After time in Auschwitz, Zigi and 20 others were moved to another camp, worked tirelessly, before being taken on a death march. Zigi became very ill with typhus. However this turned out to be their salvation as British planes bombed the German soldiers and ships, before surrounding the Jewish prisoners and freeing them. On May 3rd 1945, Zigi was liberated from the Germans and the war in Europe ended 5 days later. Afterwards they were given a choice of moving to a new country, and a new life. Later that year Zigi got a letter in Polish from a woman who had heard of him and remembered having a child of the same name. It was Zigi’s mother. She was alive and living in London and after initially not wanting to go, Zigi eventually moved to England to be reunited with his mum in 1947. It was a truly inspiring experience and showed both the best and worst of humanity. Personally, I think extremely important that we learn from and about people like Zigi, so we don’t make the same mistakes in the future, and strive for a better society and world. I would like to say a massive thank you to Miss Buck for her efforts in arranging the talk, and for all she does for the school and us. And finally to Mr Shipper, Zigi, for his time and lessons, and the great life he led.